The Supreme Court collegium comprising Chief Justice of India Dipak Misra, Justice J. Chelameswar and Justice Ranjan Gogoi, on Thursday, recommended that 37 Additional Judges from 5 High Courts be made permanent. Allahabad High Court: Those recommended to be appointed as permanent Judges are Justices (1) Rajul Bhargava, (2) Siddhartha Varma, (3) Smt. Sangeeta Chandra, (4) Daya Shankar Tripathi, (5) Shailendra Kumar Agrawal, (6) Sanjay Harkauli, (7) Krishna Pratap Singh, (8) Smt. Rekha Dikshit, and (9) Satya Narain Agnihotri. Justice Virendra Kumar-II was, however, directed to be appointed as an Additional Judge for a fresh term of one year starting from 15 November, 2018. The Collegium opined that Justice Kumar's "working" needed to be "observed for some more time". 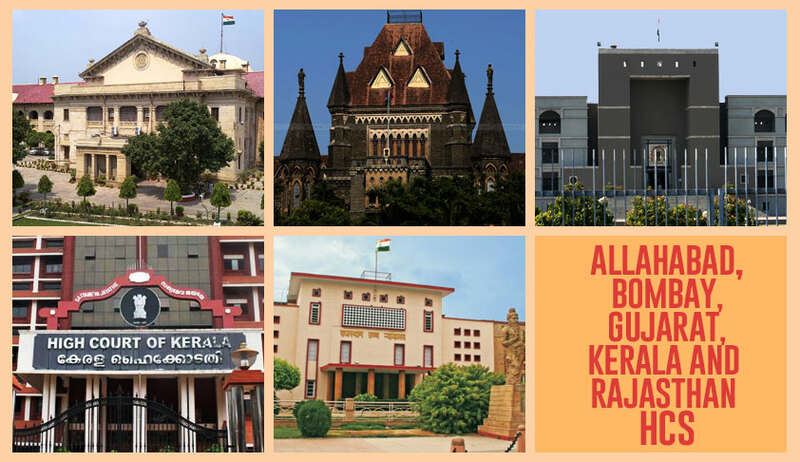 Rajasthan High Court: Those recommended to be appointed as permanent Judges are Justices (1) Ganga Ram Moolchandani, (2) Deepak Maheshwari, (3) Vijay Kumar Vyas, (4) Goverdhan Bardhar, (5) Pankaj Bhandari, (6) Dinesh Chandra Somani, (7) Sanjeev Prakash Sharma, (8) Dr. Pushpendra Singh Bhati, (9) Dinesh Mehta, and (10) Vinit Kumar Mathur. Kerala High Court: Those recommended to be appointed as permanent Judges are Justices (1) Sathish Ninan, (2) Devan Ramachandran, (3) P. Somarajan, (4) Smt. V. Shircy, and (5) A.M.Babu. Gujarat High Court: Those recommended to be appointed as permanent Judges are Justices (1) Dr. Justice K.J. Thaker, Mr. Justices (2) R.P. Dholaria, (3) Ashutosh J. Shastri, (4) Biren A. Vaishnav, (5) Alpesh Y. Kogje, (6) Arvindsingh I. Supehia, and (7) B.N. Karia. The collegium clarified that Justice K.J. Thaker would continue to function in Allahabad High Court, wherein he is, at present, posted on transfer. As per the resolution, certain complaints were received by the Department of Justice and the CJI against a few of the recommendees. The collegium, however, refused to pay heed to such allegations, noting, "We do not see any merit in the aforesaid complaints as the allegations made therein are found to be false, without any substance or are not supported by any reliable evidence/document. As they do not call for any action, in our considered view, the said complaints deserve to be ignored." Bombay High Court: Those recommended to be appointed as permanent Judges are Justices (1) Prakash Deu Naik, (2) Makarand Subhash Karnik, (3) Smt. Swapna Sanjiv Joshi, (4) Kishor Kalesh Sonawane, (5) Sangitrao Shamrao Patil, and (6) Ms. Nutan Dattaram Sardessai. Here as well, the Collegium refused to rely on the complaints received against a few recommendees, observing, "We do not see any merit in the aforesaid complaints as the allegations made therein are false, frivolous or without any substance. In our considered view, the said complaints deserve to be ignored, particularly, in the light of positive material on record."